This past Sunday, we were itching to get out and into the woods after spending all day Saturday doing yard work and other various chores around the house. We knew it had to be something short and easy because well let's face it, just getting out was asking a lot. With Robin only being in her seventh week of pregnancy, we are very limited due to how she may be feeling at any given moment. Of course she hates that that is the case but it is what it is and we make due with it the best we can. 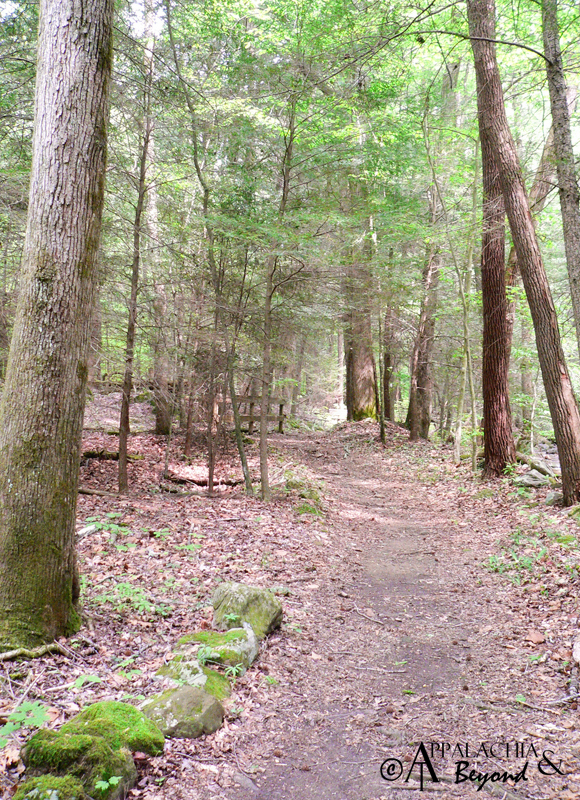 So to accommodate the mixture of pukeyness and fatigue that comes from making a baby, we decided the Interpretive Trail Loop at Frozen Head State Park would be a perfect little trail to take to enjoy some fresh air and the splendor of mother nature. You might remember this trail from a couple years back when we took the kiddos for a hike and some playing at the park. The trail starts behind the visitor center at the Visitor Center Trail which is only .3 miles to the actual interpretive loop. At .1 mile, if that, you come to an intersection where you can either go right up to Chimney Top or turn left to the Interpretive loop. The next .2 miles meanders through the woods to the loop with a small boulder field in the middle of the trail at one point and a major downhill that loses about 50 feet or so of elevation. We decided that after that descent, we'd take the road back from the Old Mac Trail once we were done. Upon reaching the Interpretive Trail after .3 miles you come to a foot bridge that begins the Interpretive Trail on the other side of Judge Branch. Prior to this point there was an excellent spot next to the creek to let our trusty sidekick Clover off the leash to play in the creek. Boy did she have fun but she did think the water was a little cold. Upon crossing the footbridge you can stay straight on the loop to the Old Mac Trail or turn right on the loop. We opted to go right and walked along creekside for about .3 miles. Along this part of the trail you can see remnants of what used to be part of the old CCC camp that helped build the park and trails back in the 1930's. At about .4 miles on the loop there is a nice bench next to the creek with a big spot in the creek that is deep enough to take a dip if one so desires. There is a nice waterfall/cascade down the rock face at this point, too. We decided to sit on the bench and let Clover play in the creek some more. We sat on the bench amongst the hemlocks listening to the birds chatter away and watching butterflies flit to and fro all while Clover enjoyed her romp in the water. 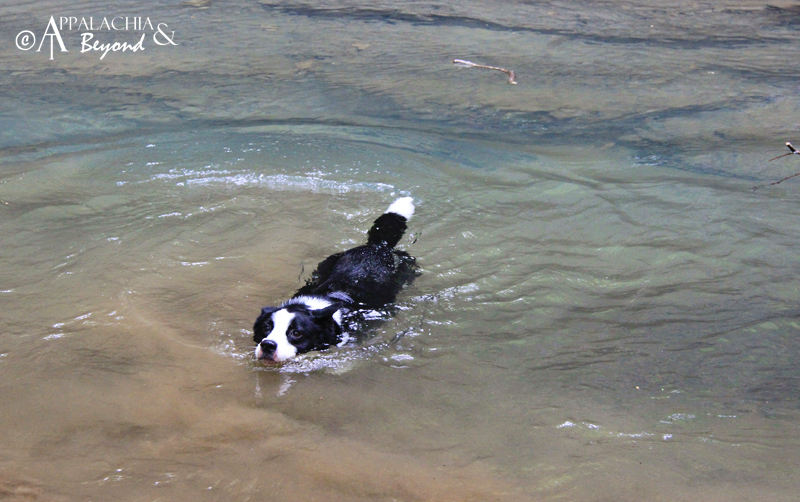 She just absolutely loves the water so long as it isn't too deep. After this spot it's about .1 mile to the intersection with the South Old Mac trail. At this point you can turn right to continue up South Old Mac to Judge Branch Trail or Spice Branch Trail or stay on South Old Mac to the Fire Tower. To the left is Old Mac trail that leads back out to the Picnic Pavilion at the Old Mac trailhead. 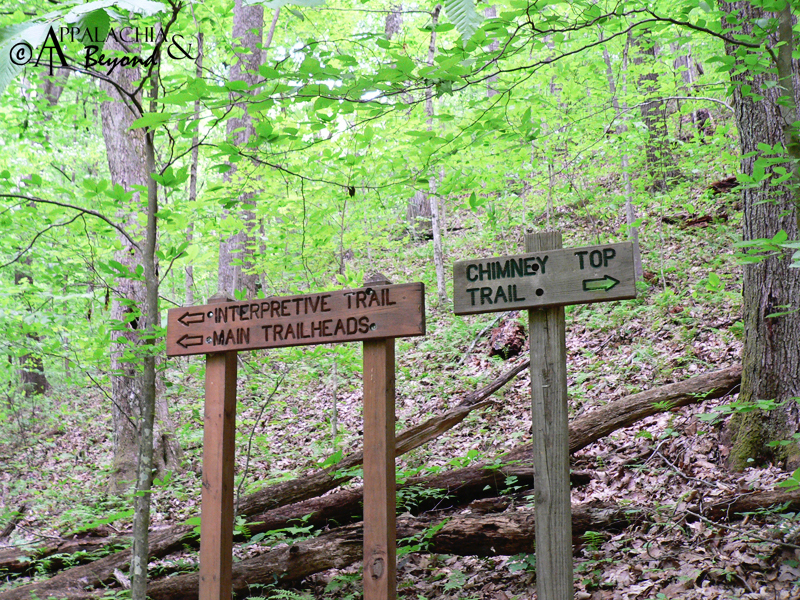 It's a straight shot to the trailhead from here with an intersection on the right at .15 miles to North Old Mac trail and another trail junction at .3 miles, just before the trailhead, back on the Interpretive loop to the Visitor Center and Chimney Top trails. 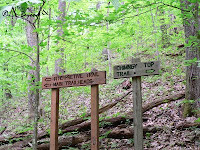 Considering we didn't want to have to ascend the one descent we had coming down the Visitor Center trail we headed out to the trailhead at the picnic pavilion and across the road to the Flat Fork Walking Trail back to the visitor center. The walking trail starts at the road to the campground and follows Flat Fork creek all the way back to just before the visitor center. We ended up heading back to the visitor center of course after a short Clover detour to find the perfect spot - if you catch my drift. At the end of the walking trail you have to walk onto the road to cross the bridge across Flat Fork Creek. 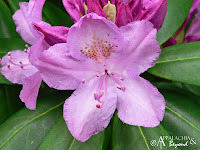 On the other side of the bridge, there is an open field area to the right and the visitor center on the left - which is bordered with some very showy rhododendrons this time of the year. Next to the field is a big pool area of the creek that, when the creek levels are up like they are now due to all the rain, provides for another great swimming area. 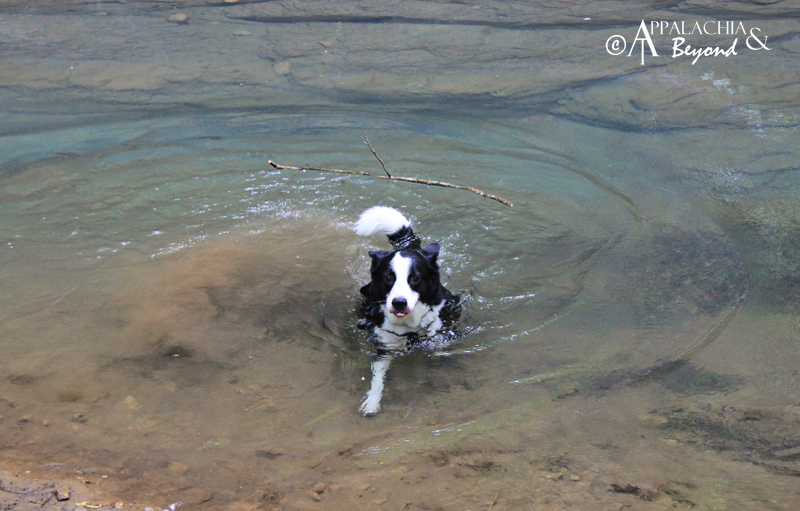 Of course, Clover had to have one last dip before we headed back to our car to finish the hike. Once we were done we had hiked a total of 1.77 miles. 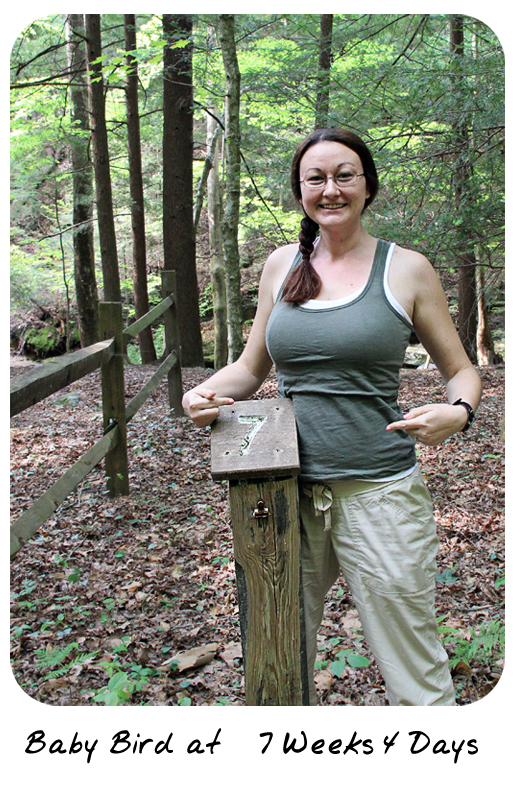 Of course it was probably more like 2 miles if you count the major Clover detour, but total trail miles ended at 1.77. Total elevation gain was 115ft. 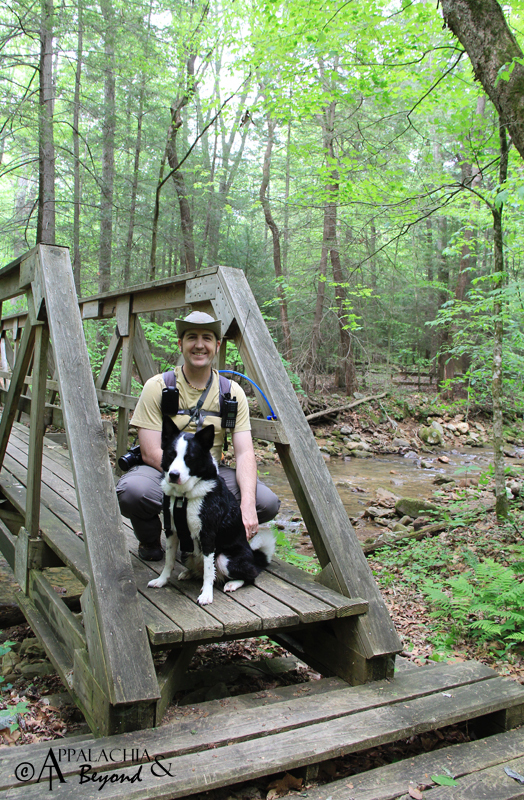 So if you are looking for a nice scenic and easy trail, the Interpretive Loop at Frozen Head is a great one to take. 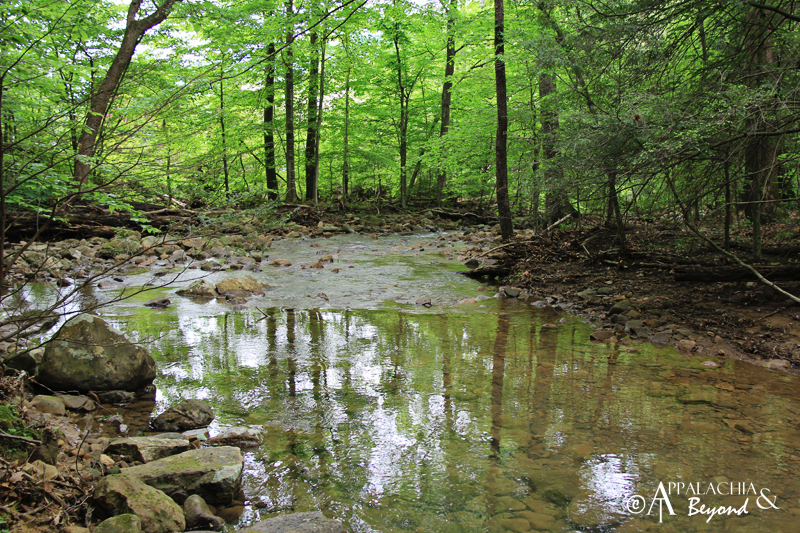 It offers a lot of scenery, plenty of cool views in the woods, cool dips in the creek, and makes for a pleasant walk in the woods.